Let us create your next special catering event at our place or yours! We can cater and customize special events for private groups and corporate events for as few as 10 to as many as 300. Call us at 316-721-5554 to get started. Below is our standard catering menu, which occasionally changes as menu items change for our in-house food service. Not seeing what you’d like? 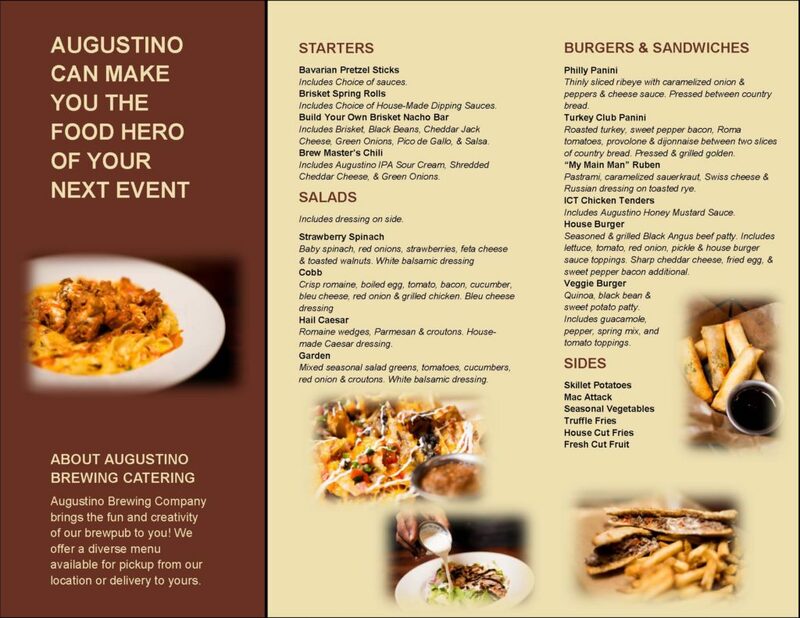 Our trained kitchen staff can customize a menu that is as special as the event you are hosting. Pickup or delivery service is available on all orders over 25 persons we are able to cater groups from 25-300. 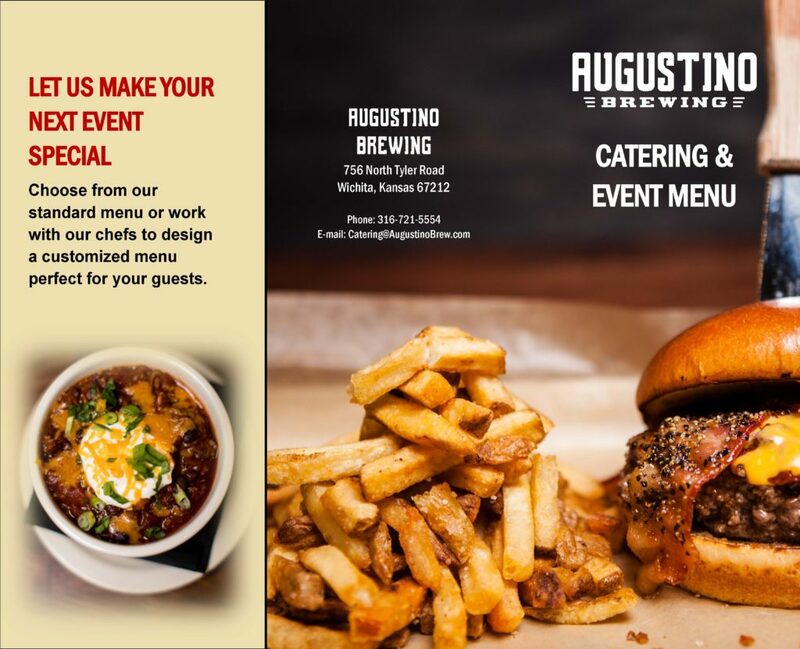 Please contact our catering manager at 316-721-5554 for current pricing. Very competitive discounts available for larger groups. Have a smaller group than 25? Check out wichita2go.com for menu and delivery options for your event. Pretzel Sticks – Includes Choice of Brewer’s Fondue and/or Honey Mustard Sauces. Pork Spring Rolls – Includes Choice of 1 or More House-Made Dipping Sauces. 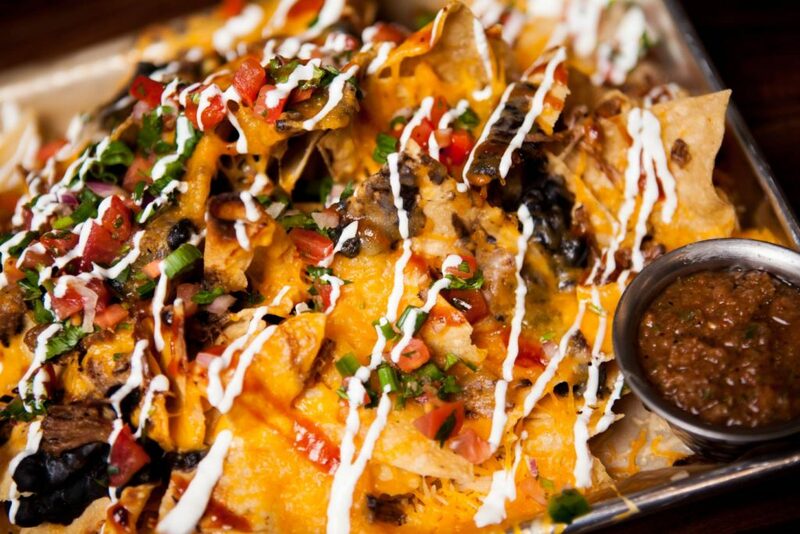 Build Your Own Brisket Nacho Bar – Includes Brisket, Black Beans, Cheddar Jack Cheese, Green Onions, Pico de Gallo, House Tortilla Chips, and Salsa. Brew Master’s Chili – Includes Augustino IPA Sour Cream, Shredded Cheddar Cheese, and Green Onions. Strawberry Spinach – Baby spinach, red onions, strawberries, feta cheese & toasted walnuts (white balsamic vinaigrette dressing recommended). Cobb – Crisp romaine, boiled egg, tomato, bacon, & grilled chicken (bleu cheese dressing recommended). Hail Caesar – Romaine wedges, Parmesan & croutons tossed in house-made Caesar dressing. Garden – Mixed seasonal salad greens, tomatoes, cucumbers, red onion & croutons. Choice of dressing(s). 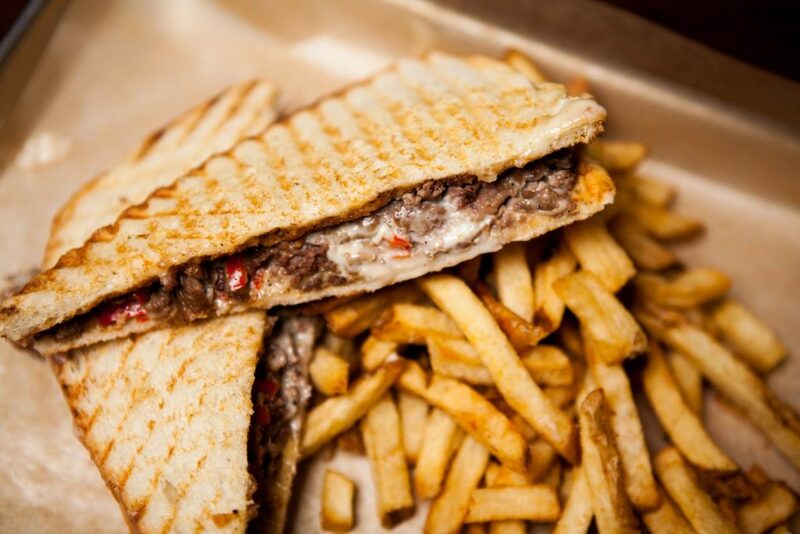 Philly Panini – Thinly sliced ribeye with caramelized onion & peppers & cheese sauce. Pressed between country bread. Turkey Club Panini – Roasted turkey, sweet pepper bacon, Roma tomatoes, provolone & dijonnaise between two slices of country bread. Pressed & grilled golden. “My Main Man” Ruben – House cured & slowly smoked pastrami, caramelized sauerkraut, Swiss cheese & Russian dressing on toasted rye. ICT Chicken Tenders – Includes Augustino Honey Mustard Sauce. Chef Guy’s Fish – Includes Tartar Sauce and Coleslaw. 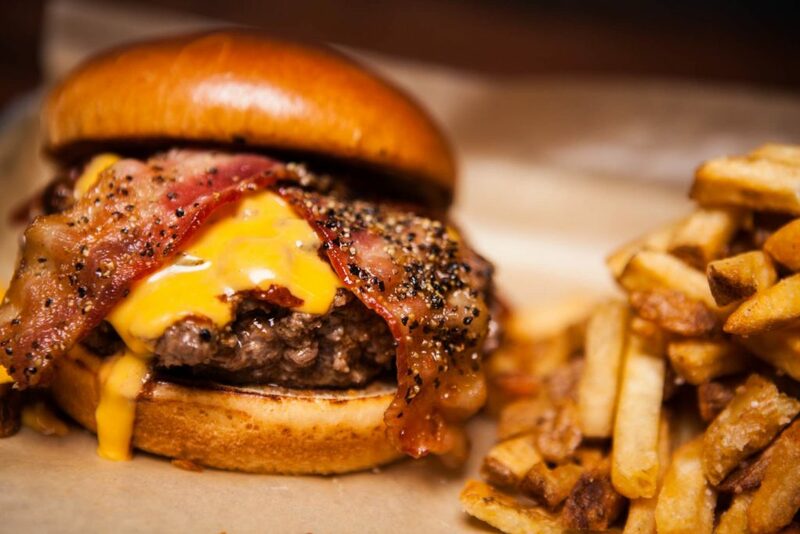 House Burger – Seasoned & grilled Black Angus beef patty. Includes Choice of Toppings. Veggie Burger – Quinoa, black bean & sweet potato patty. Includes Choice of Toppings. How can we make your meeting or event special? Please contact our catering manager at 316-721-5554 to get started!